Stevens Institute of Technology is shaping the next generation of leaders in the worlds of business and finance. 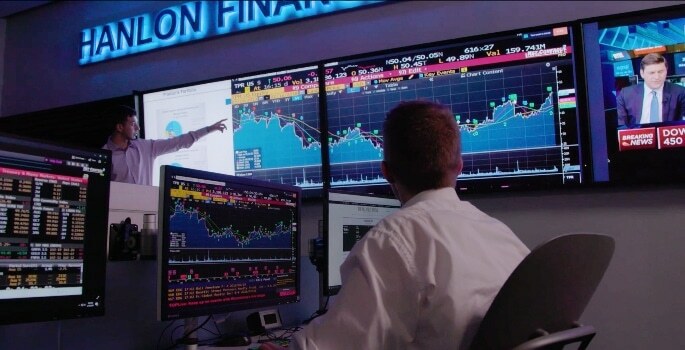 Based in New Jersey, this leading high-tech finance education institution, just across the river from New York City, is recognised for its success in placing students into prestigious companies. 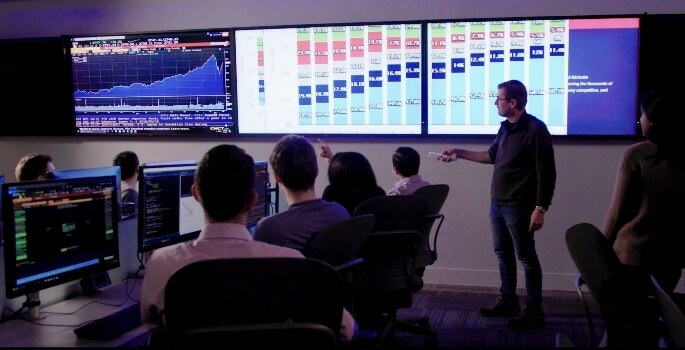 To meet the demands of a more data-rich future, and to build upon its growing reputation as a leader in the field, Stevens invested in Oblong’s Mezzanine immersive visual collaboration technology for its state-of-the art financial systems and data visualisation labs. In the classroom and in the lab, wherever you’re monitoring real time activity from multiple sources, as you’d naturally have with the financial markets, it’s imperative to see these multiple sources at the same time, side by side. This enables multi-threaded conversations to take place, with enhanced graphics and the visual capabilities to share presentation materials alongside market news, interviews, and corporate data simultaneously. Stevens Institute was ready to move past “medieval models of lecture delivery” to establish a more interactive and collaborative process in the learning environment of the 21st century. The school was planning to build a new lab for analytics and data visualisation. It had been 4-5 years since the last one was built, and the university team knew that hardware-based solutions become dated quickly. George Calhoun was on the hunt for something new. He found it with Mezzanine, which brings smart software for enabling multiple streams of content across multiple devices in multiple locations and complements it with gesture-based control (among several modes) though its proprietary hardware sensor system. “These new labs provide the tools and the technologies to make good decisions and it also provides the environment of collaboration that is needed to address major problems both in business and in finance,” said Gregory Prastacos, Dean of the School of Business. “Unless you’re moving [workflows] into a more visual and immersive kind of mode you’re going to have a lot of trouble even coping with the data that you’re getting out of the market today,” commented George Calhoun, Director of the Quantitative Finance Programme. It is important to remember that a part of the culture of Gen Z and even Millennials is that they’ve grown up with a very high-powered computer in their pocket, and they’re all connected with each other, and the internet, on a constant basis. They are accustomed to social media and all the modalities that are available of them. As a teacher, you have to ask yourself how to embrace it? Or suppress it? It’s an important question: Not to put it down and turn it off, but to bring it up and use it. Mezzanine allows technology to contribute to the conversation of the classroom instead of trying to suppress it. This draws people in. People can pop stuff up on the screen simply and easily. You’ll find students illustrating each other’s talking points and the teacher’s talking points too. This is a super clear signal of rapt attention and engagement. One of the capabilities on the Mezzanine road-map that the school is looking forward to is the ability to network with others who have Mezzanines. Right now the school can connect between labs. It’s powerful for collaboration. Linking to Mezzanines externally would be more so. The network effect is very powerful in industries like the financial industry. When everyone has it value goes up exponentially. As an example: Think about the difference between a town in the 1930’s that had three telephones shared amongst the entire population vs. that same town now where everyone has a smart phone in their pocket. Mezzanine is a key asset of the programme. It illustrates the university’s commitment to the kinds of technology students are likely to encounter in the future, and the commitment to students to prepare them for success. Generation Z is the generation born between 1994 and 2010. The first wave will be entering the workforce in 2016.